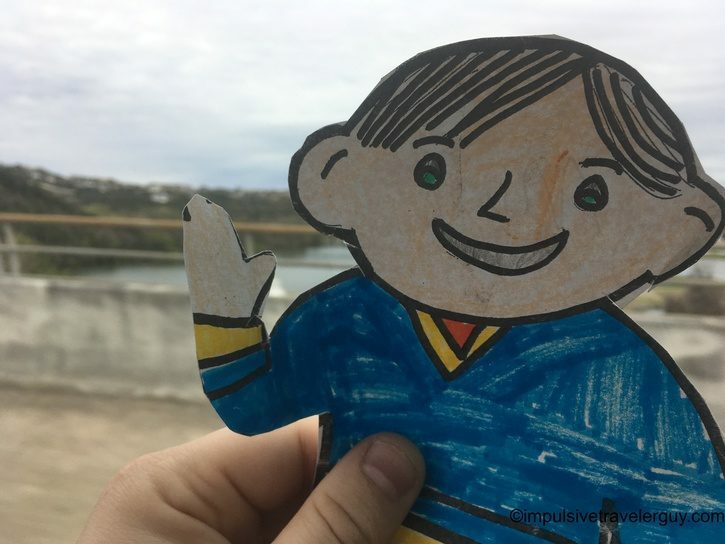 My buddy Mike messaged me about a project his son Max was doing at school. 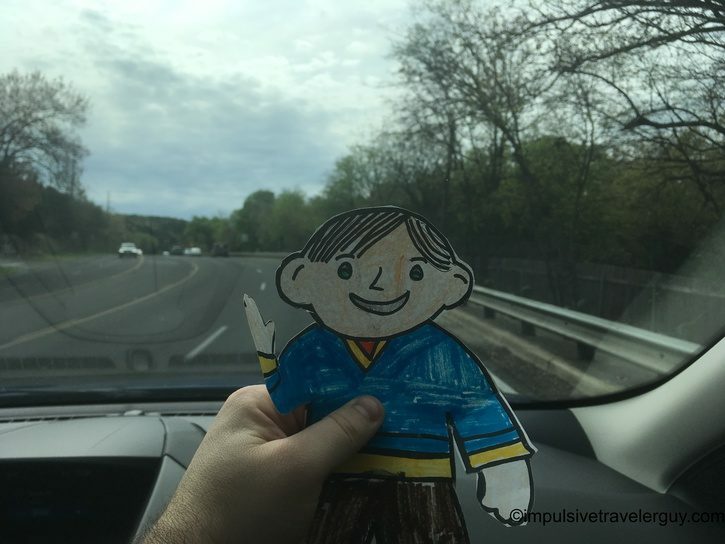 It is called “Flat Stanley.” It is based on a book by Jeff Brown. 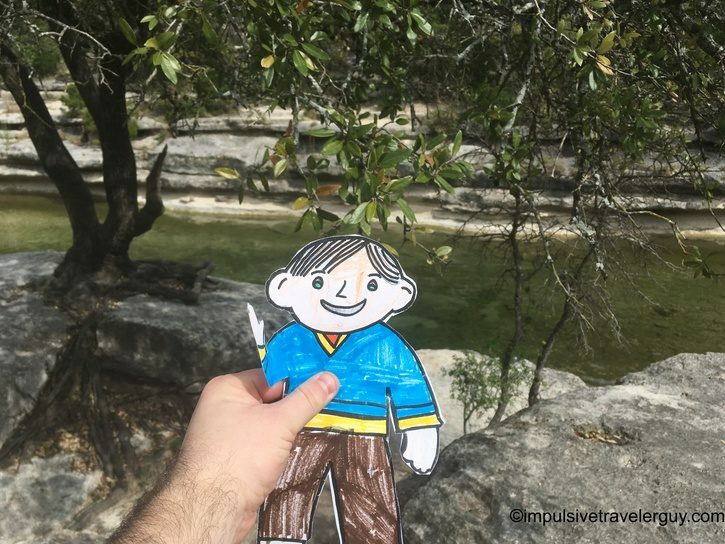 In the book, Flat Stanley goes on many adventures. 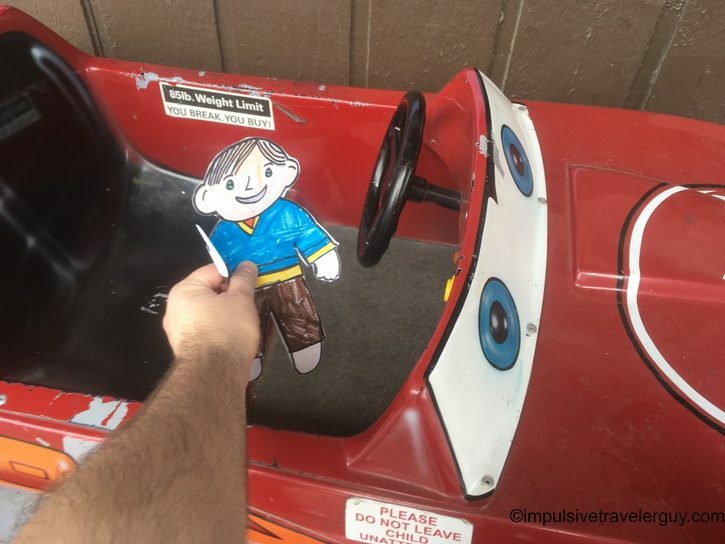 Since he is flat, it is easy for him to get around. 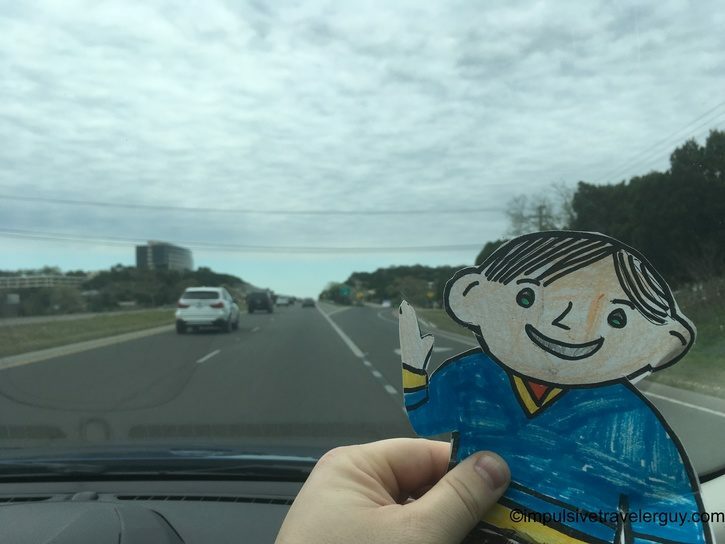 I had never heard of this project prior to this, but Victoria did it when she was in elementary school. 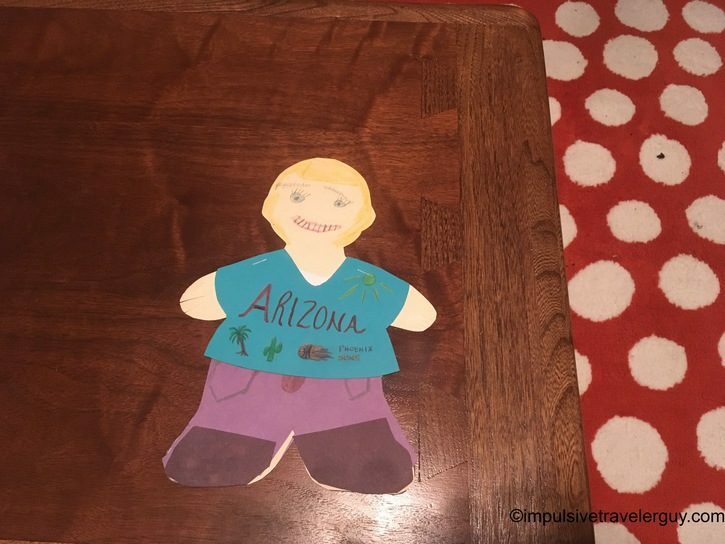 She had made a “Flat Victoria” that visited Arizona. Once she explained the project to me I thought it was going to be a lot of fun. 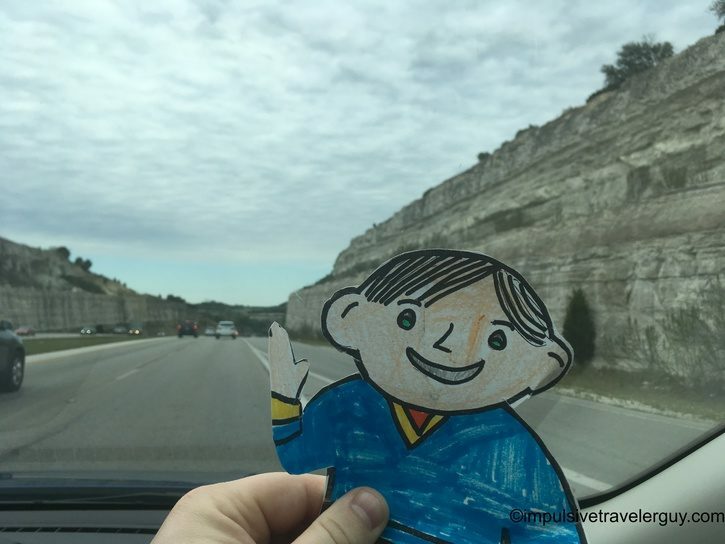 I got to compare Austin to my hometown of Marshfield, Wisconsin and explain it like I would to Mike’s son Max. Victoria actually still had her Flat Victoria. 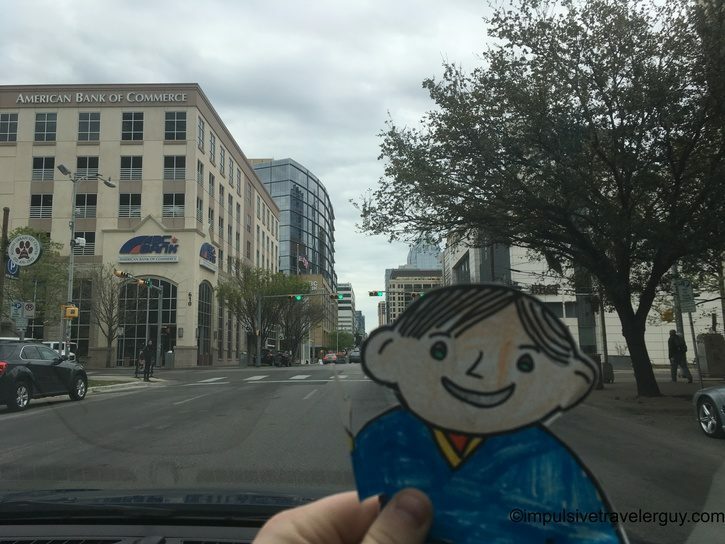 Flat Max arrived in the mail and we were excited to show him around Austin, Texas. 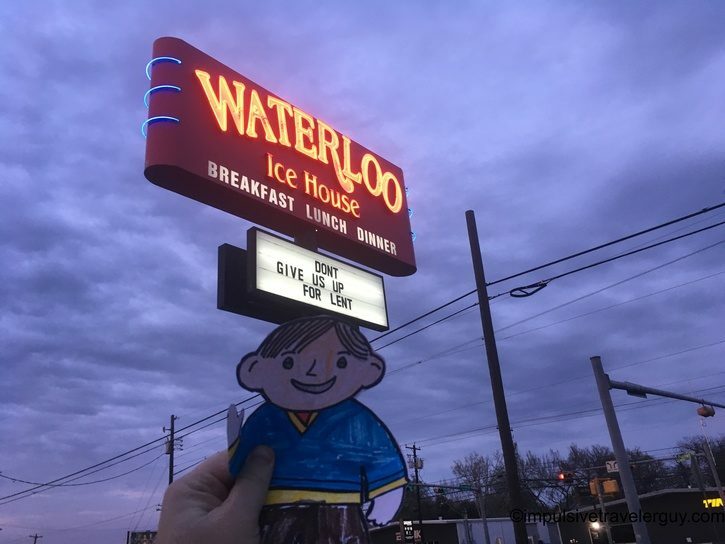 Our first stop was Waterloo Ice House. 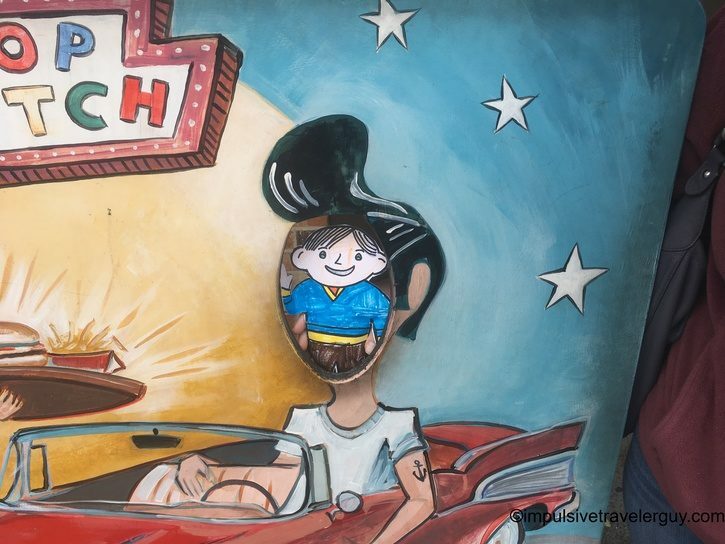 This is one of my favorite places to eat in Austin. 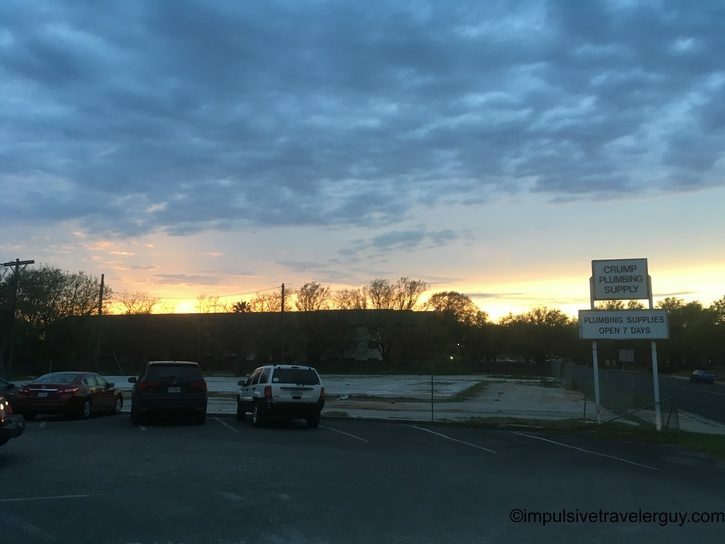 There was a beautiful sunset that night. The sign said, “Don’t give us up for Lent.” We definitely weren’t going to do that. We started with some chips and queso. Queso is Spanish for “cheese.” In Austin they melt this cheese. You then dip a tortilla chip in it. 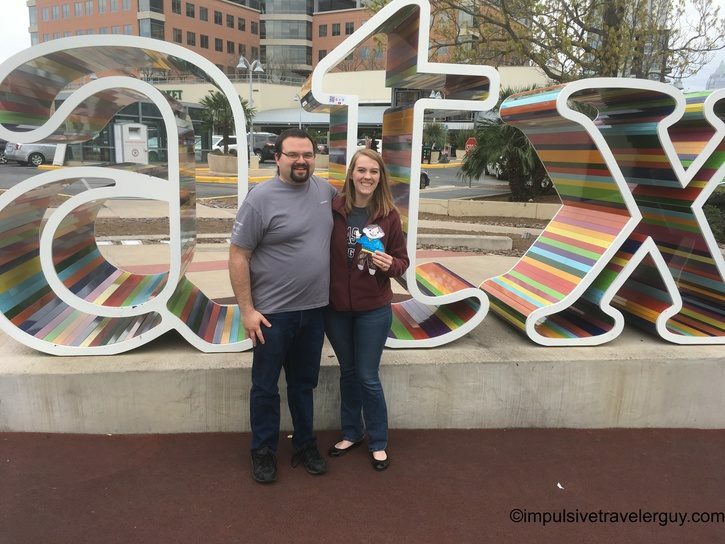 Everyone loves chips and queso in Austin! 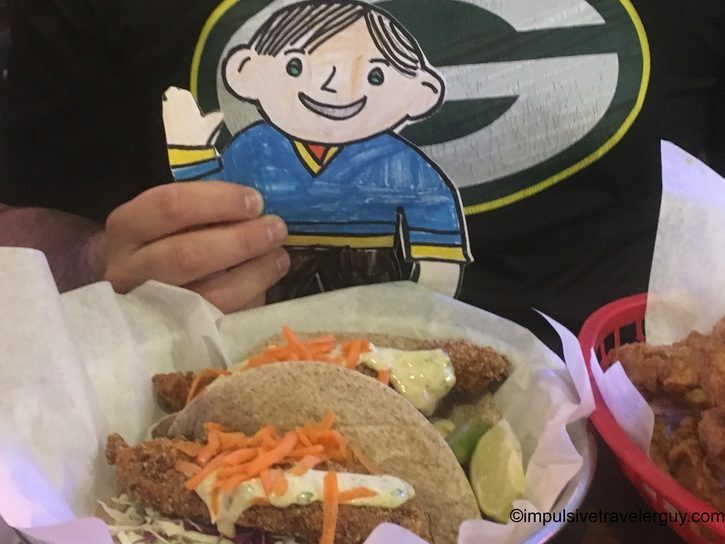 The main meal was catfish tacos. Tacos are a serious business in Austin. 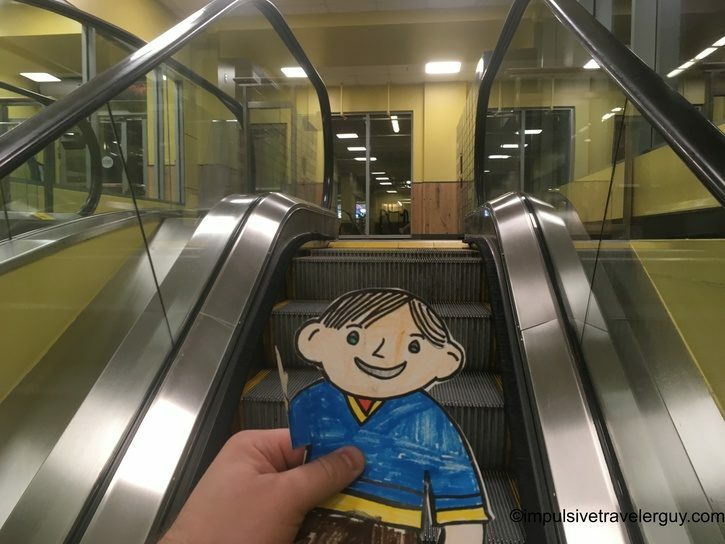 You will find them everywhere! Waterloo Ice House put their unique twist on them for Fridays in Lent. 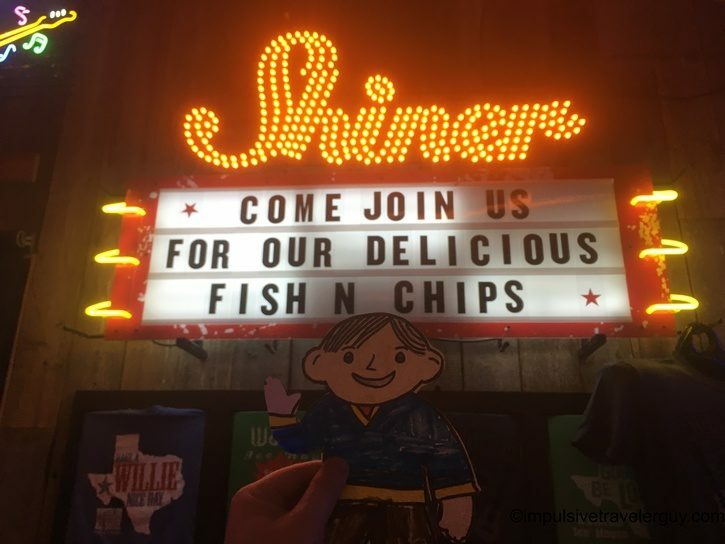 We didn’t give them up for lent and Max and I enjoyed catfish tacos. Tacos are a staple of Austin and this was a nice twist Waterloo Ice House had put on them. It is like how people get fish on Friday nights in Wisconsin. The only difference is we put our fish in tacos! Fish tacos weren’t the only fish we could have got. There is also fish and chips. Maybe next time! We went home and got a good night’s sleep. 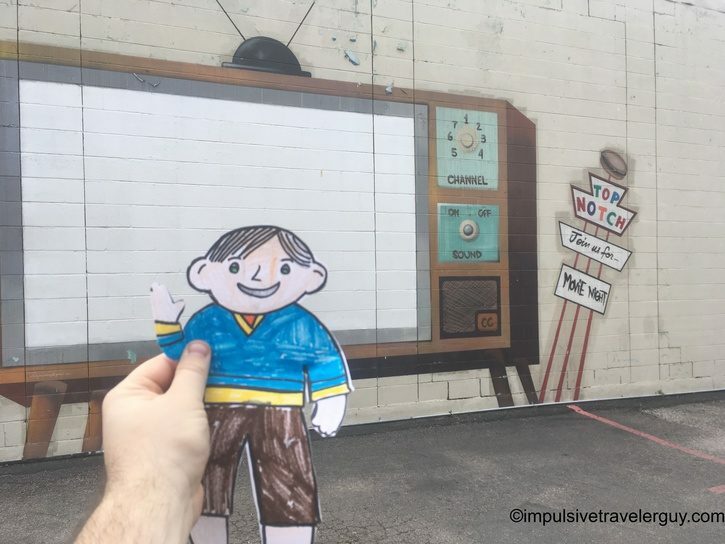 The next day would be filled with a lot of adventure! We slept in a bit and skipped breakfast. We wanted to save our appetites for a big lunch. 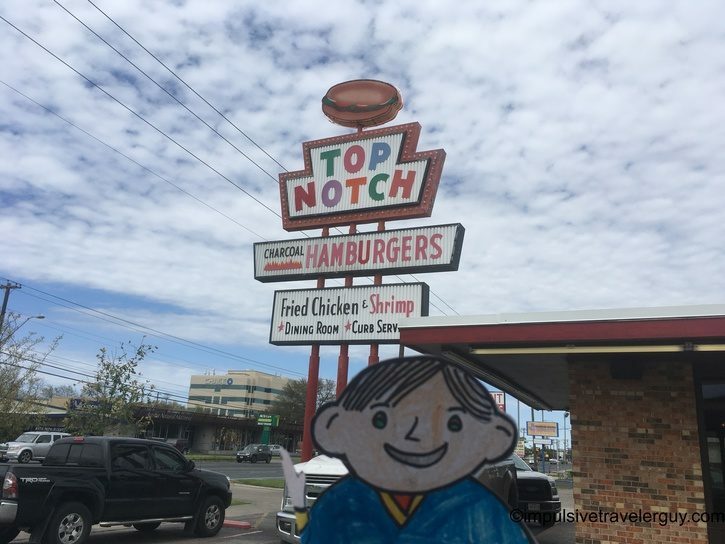 We stopped at Top Notch Hamburgers. 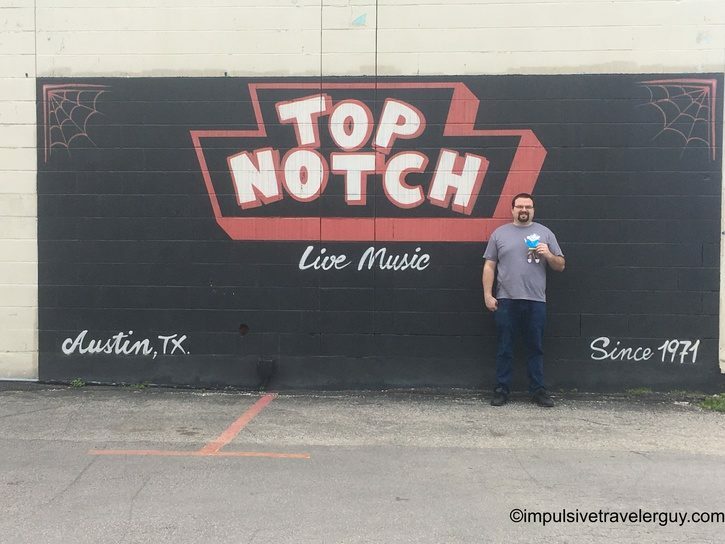 Top Notch is a very famous place. There is a scene that was filmed there from the movie Dazed and Confused. They are also known to have monthly car shows so a lot of cool old cars show up. 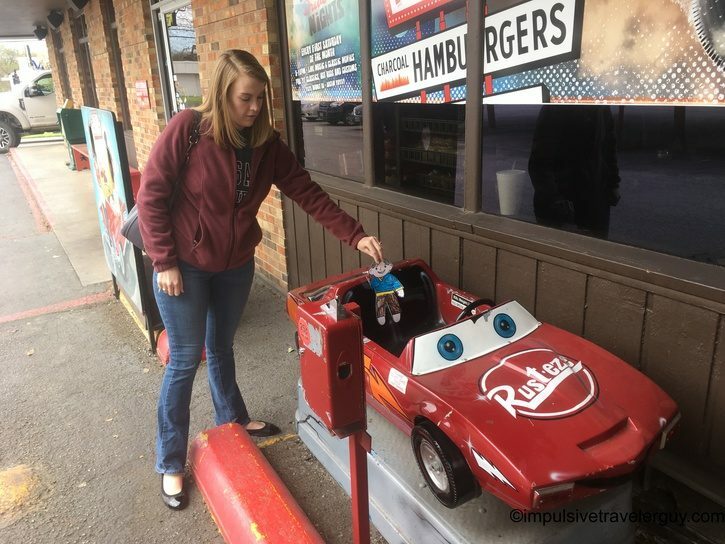 They are one of the rare drive-in places left and they have a classic 1970’s look. We walked around the outside and took a bunch of pictures. They make burgers the same way that they do at Chips in Marshfield. They flame broil them. 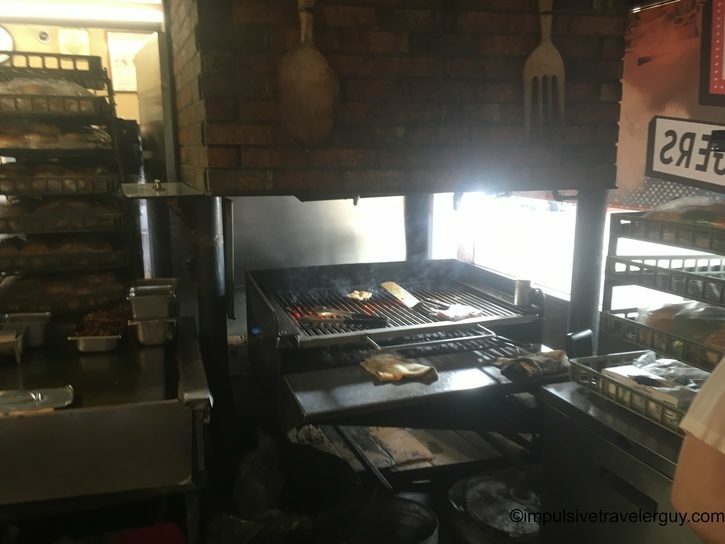 You can see the flames shooting up as the burgers cook! We all ordered our food and waited for our names to be called to pick it up. 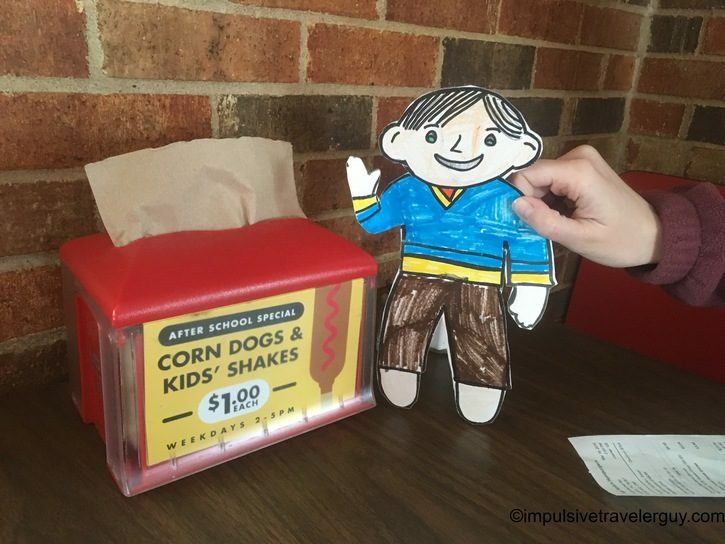 We showed Flat Max the after school special they had. 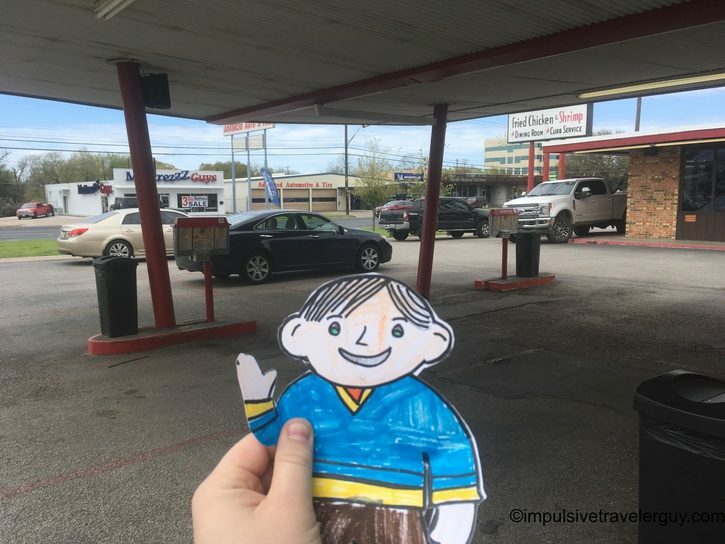 If he lived in Austin, he could make this a daily stop! The fun just isn’t for children. 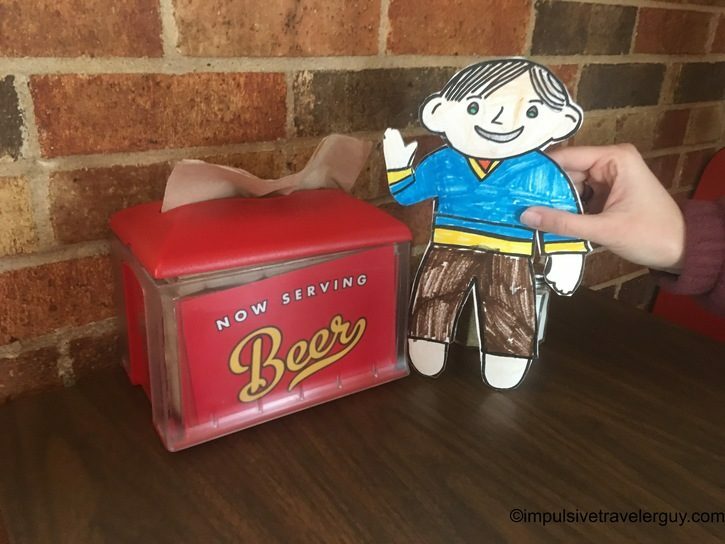 Once Flat Max turns 21 years old, he could get a beer. 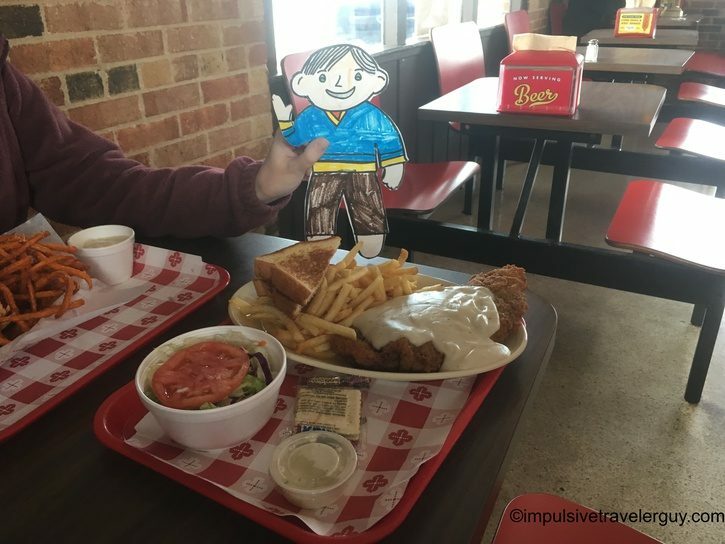 Flat Max and I shared a chicken fried steak. This is when you take a steak but cook it like a piece of fried chicken. You then put a bunch of white cream gravy all over it. This food more represents Texas and the Southern United States. 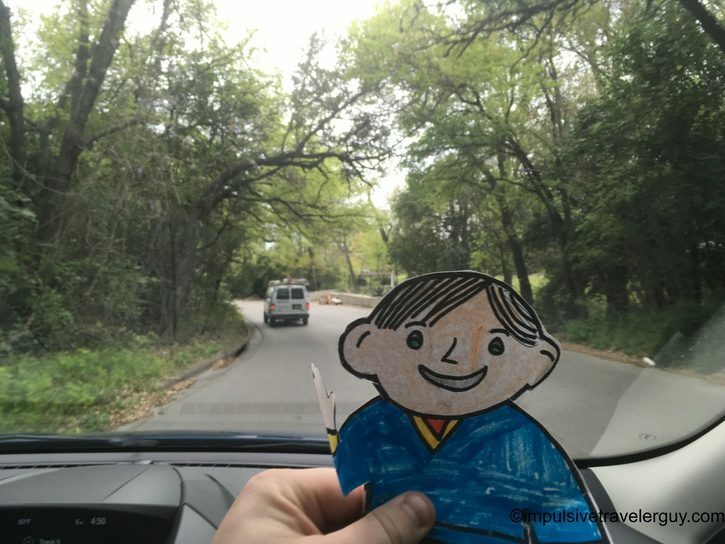 Austin is a very big city, but there are a lot of green areas with many trees. 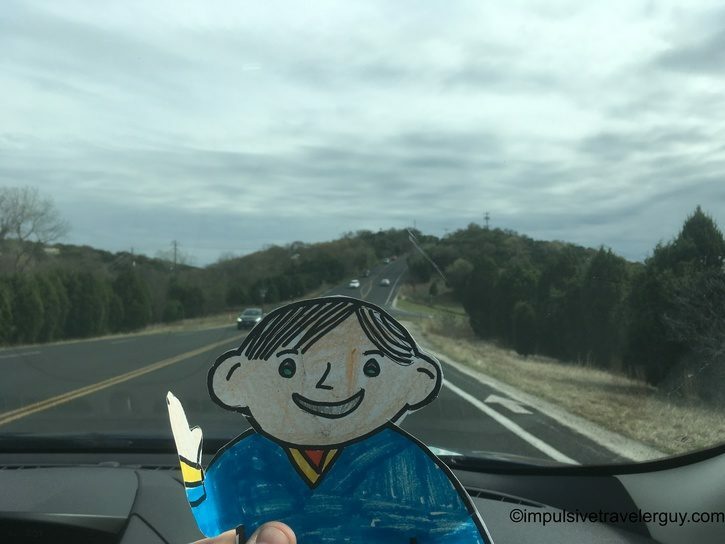 It is on the edge of what is called, “Texas Hill Country.” There are many hills around the area and the roads wind around these hills. 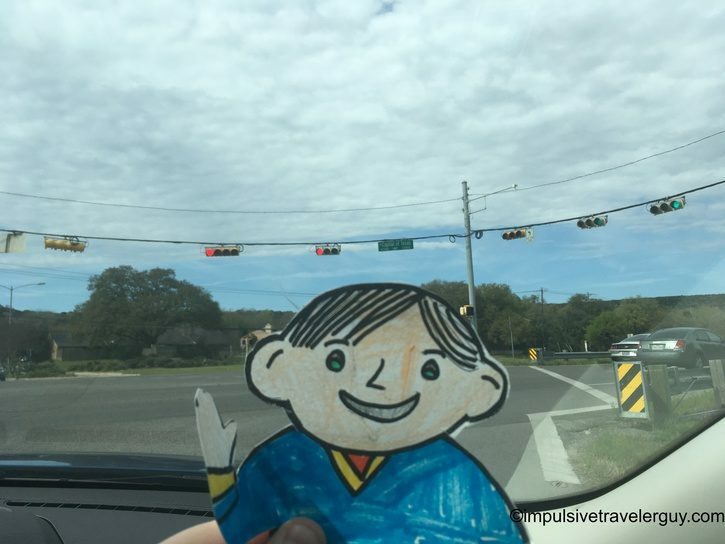 After eating, we took one of these windy roads to an area called Bull Creek. 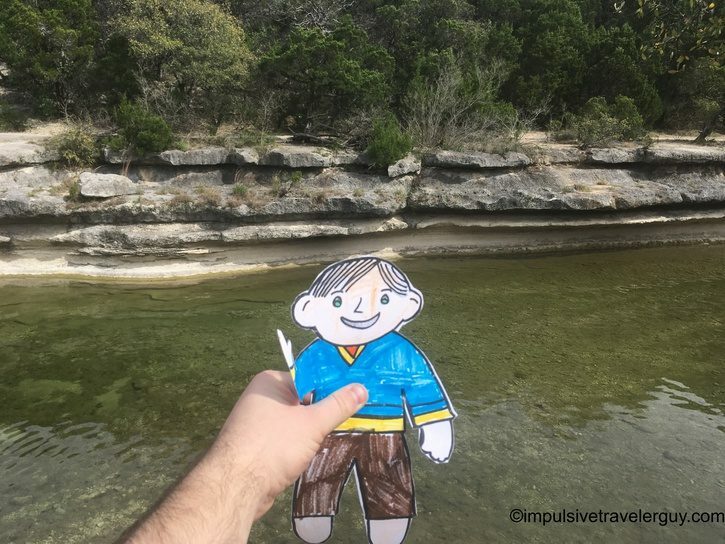 Flat Max got to do a Texas tradition. 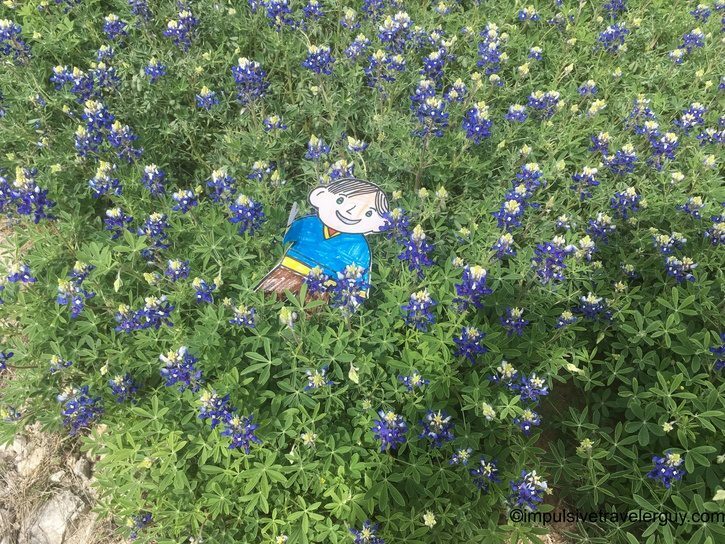 The bluebonnet flowers were blooming and we took his picture in them. 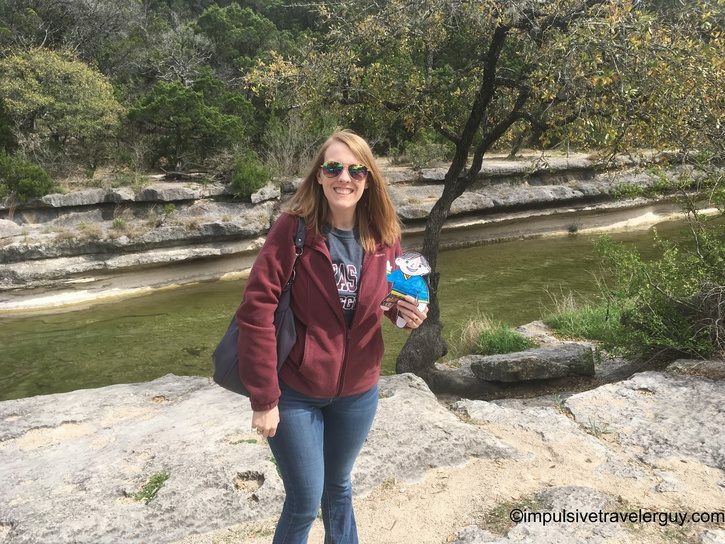 This is a yearly tradition for parents to take their children’s pictures in the bluebonnets. 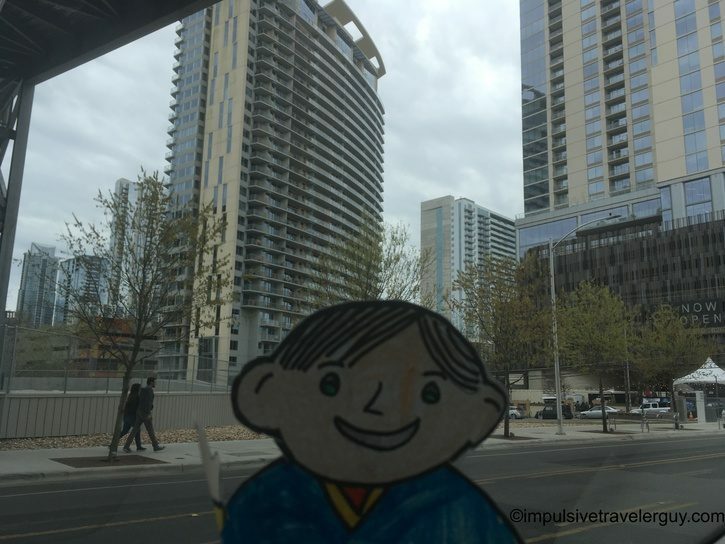 It was lucky Flat Max visited when he did! 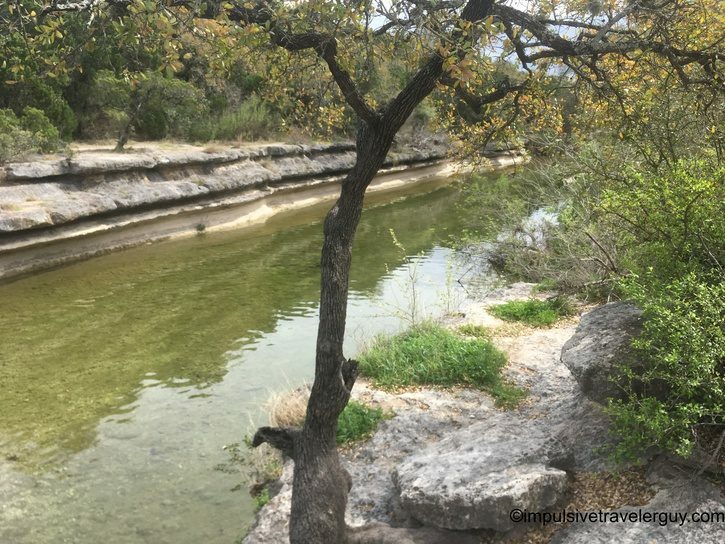 We all walked down by the water of Bull Creek. The temperature was in the 60’s so it was much warmer than it was in Wisconsin. 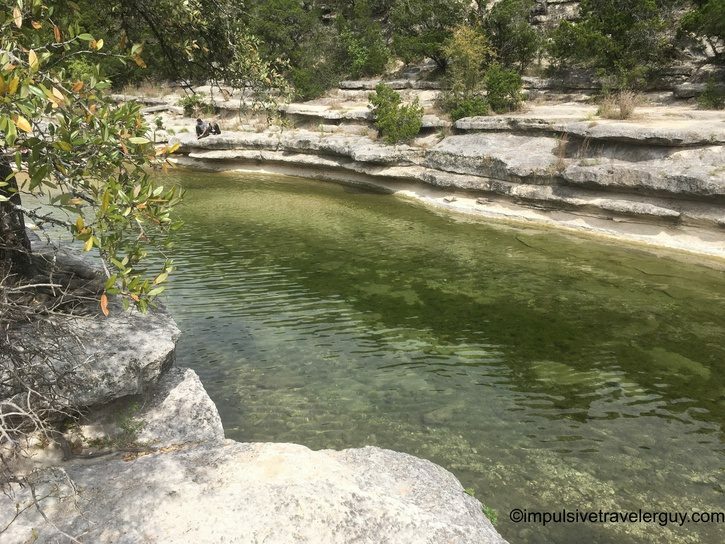 It is still a bit cold for swimming, but if it did warm up, we could have went swimming! 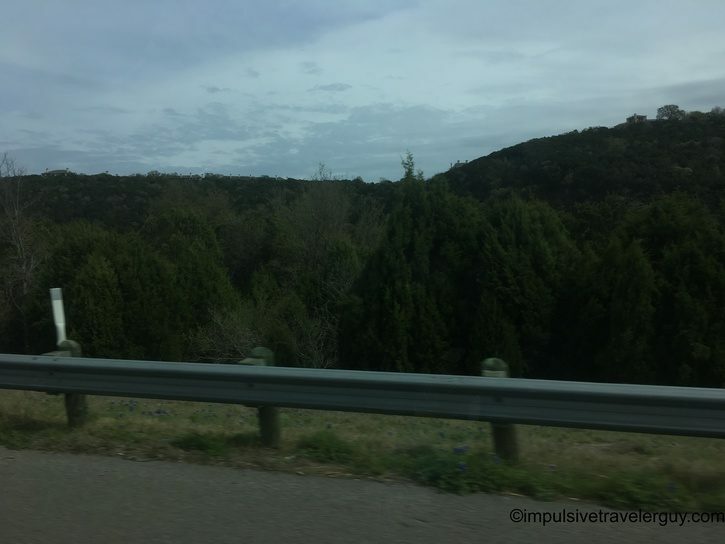 The scenery is beautiful around Austin. It is amazing to think you can see all this right in the city. 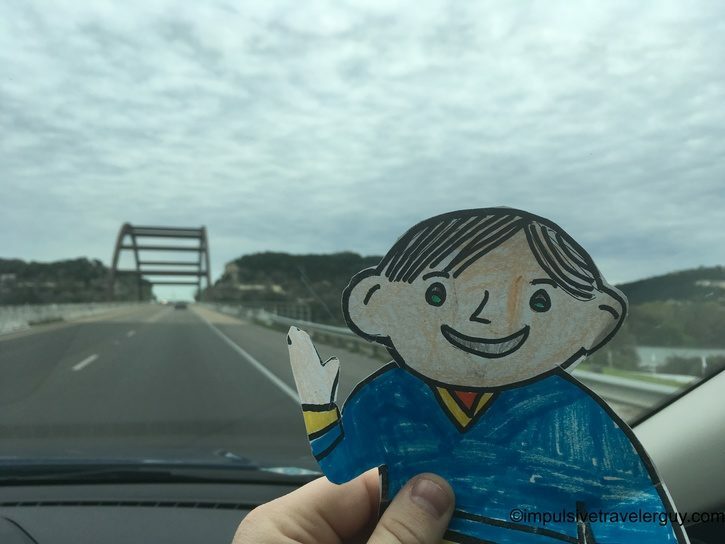 After taking in the nature, we decided to drive to downtown where all the buildings are. 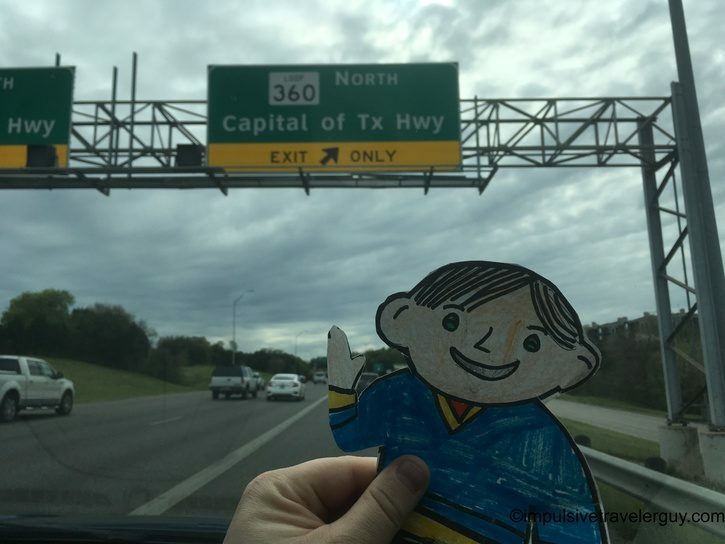 One of the roads we took is called the “Capital of Texas Highway.” Austin is the capital of Texas and this highway would take us from the scenic countryside to all the large buildings of the city. 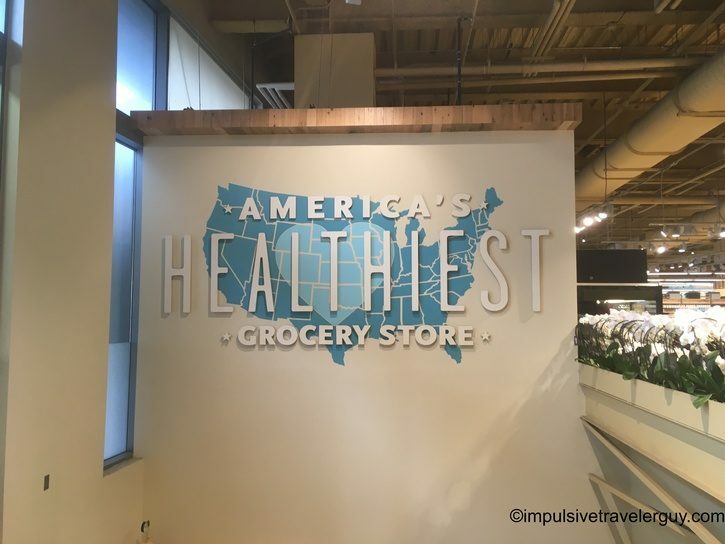 The chicken fried steak we ate earlier is not the healthiest. We can be forgiven though. 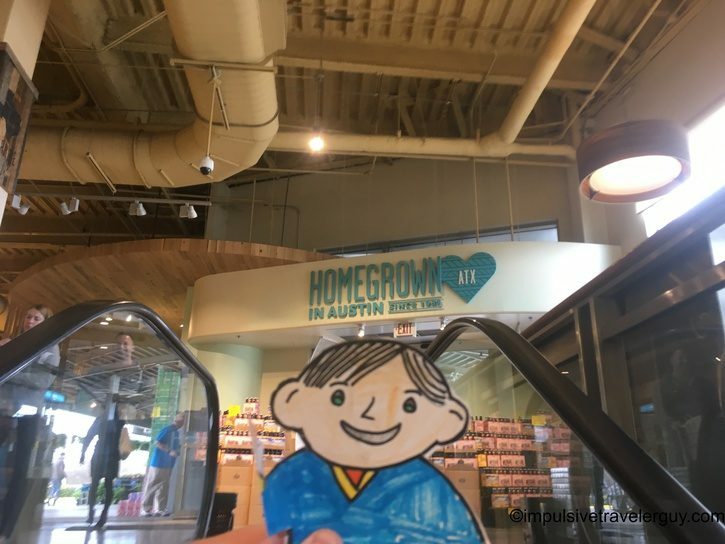 Austin is home to Whole Foods. 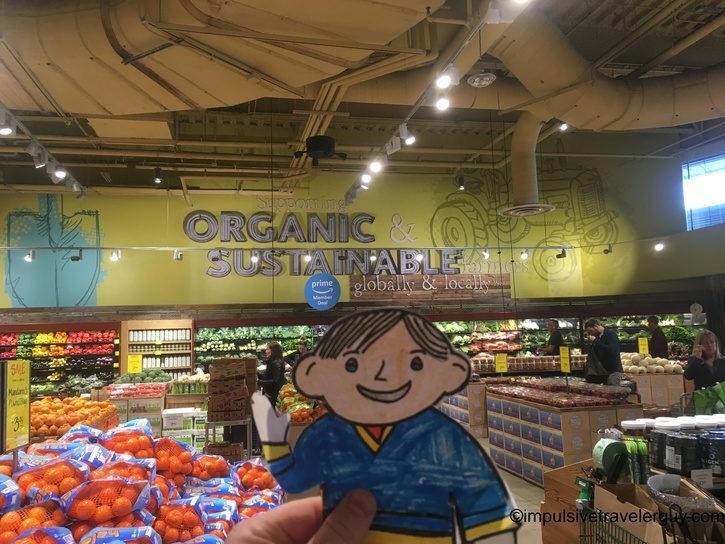 Whole Foods sells a lot of different healthy foods. 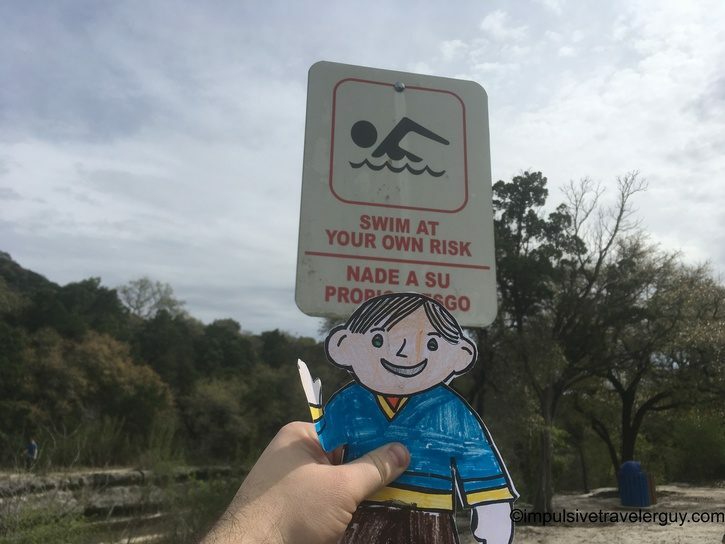 We went to the main one that is in Downtown Austin. 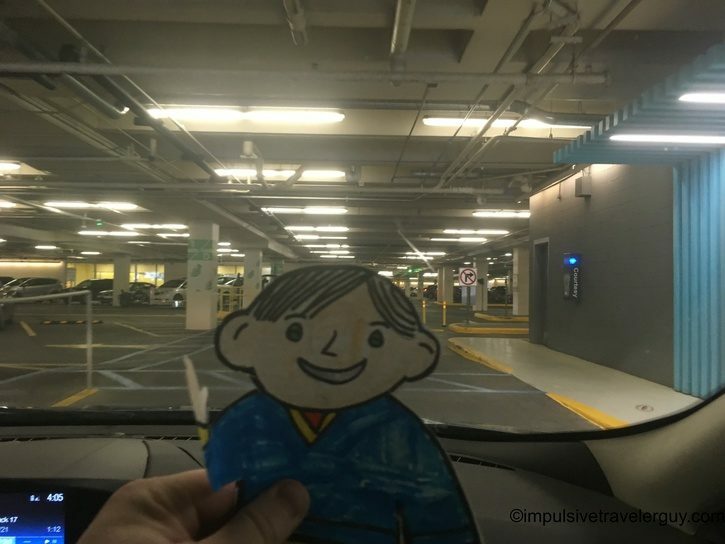 It even has its own parking garage under it that you have to take an escalator to get into the store! Before we did some shopping, we went outside to take some pictures. 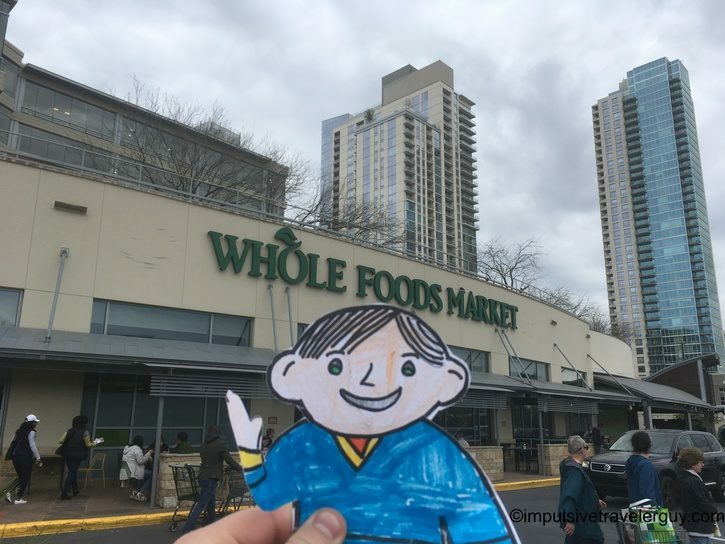 On the street corner in front of Whole Foods is the famous ATX sign. 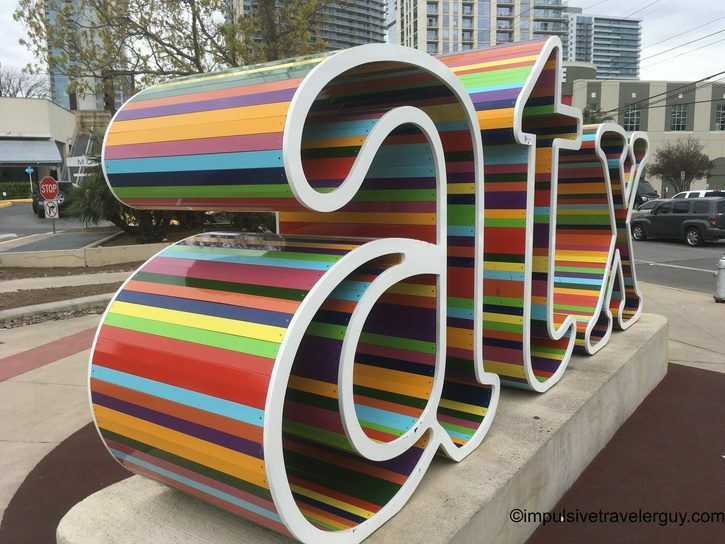 ATX is short for Austin, Texas. 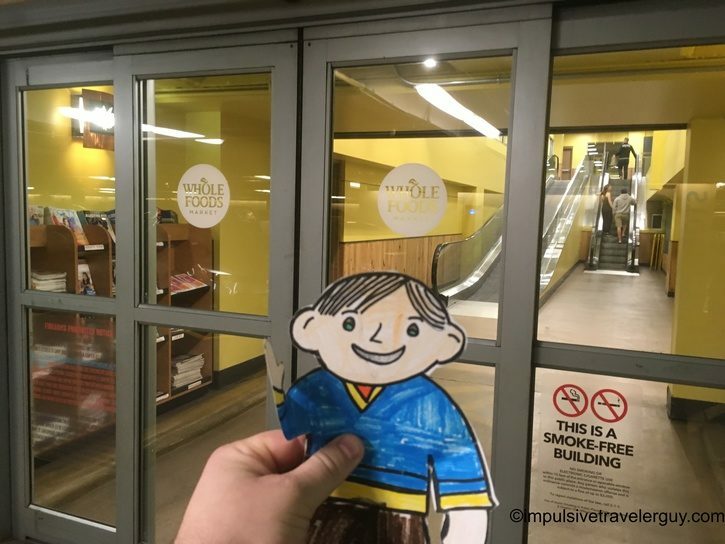 We went back inside to look around. 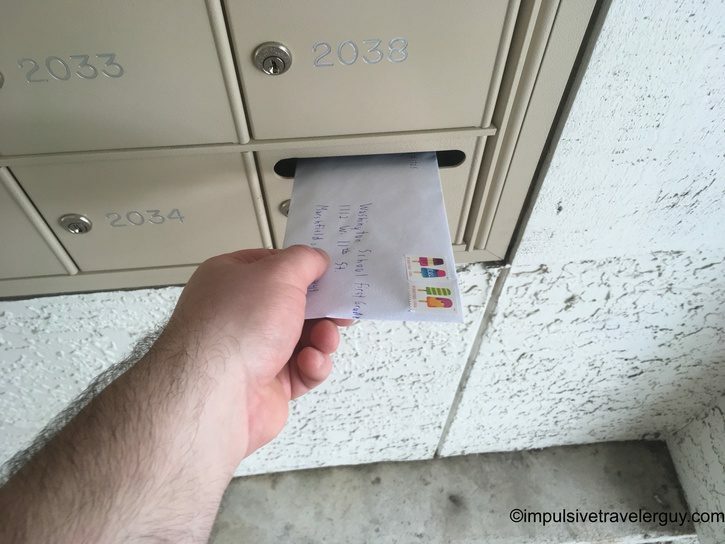 I typically don’t pass up samples. 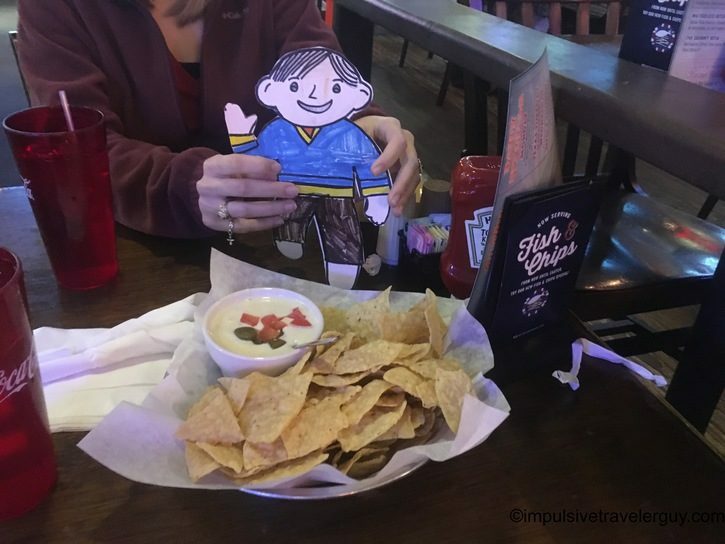 Flat Max also wanted to try the samples and take a picture with the nice lady giving them out. 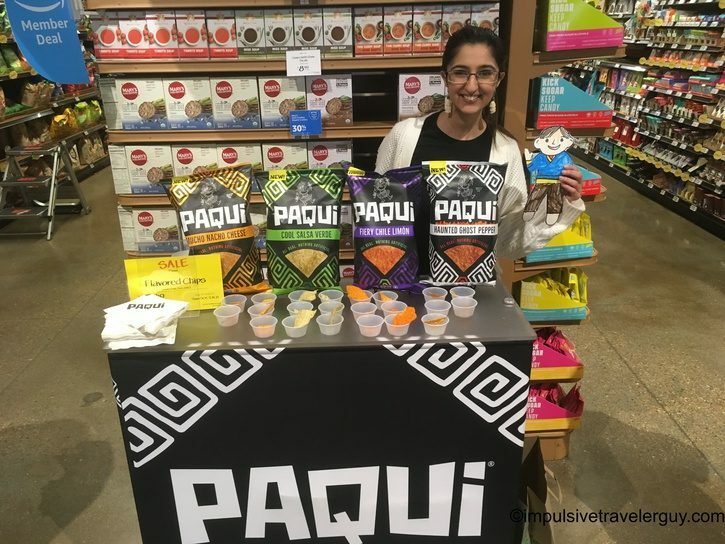 We tried these tortilla chips called Paqui. 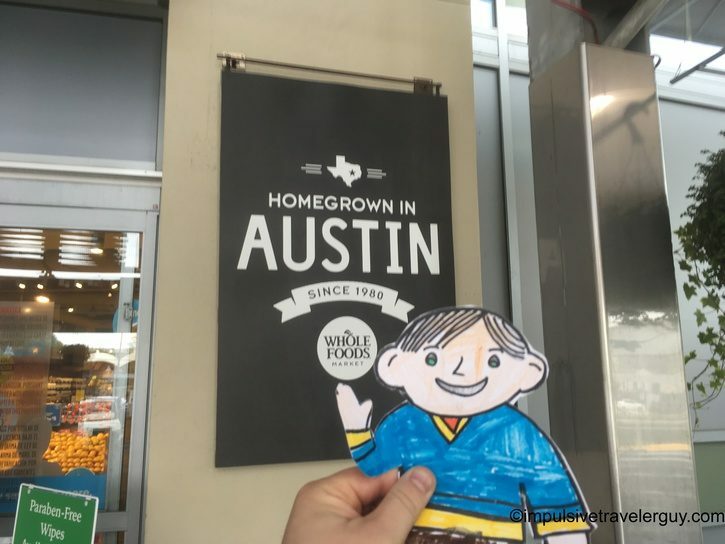 There are made right here in Austin and are really good. They are like Doritos, but have their own flavor. Some of them are very spicy and they are all made will all natural ingredients. You can read my review on them here. We bought two bags of these chips and brought them to the car. 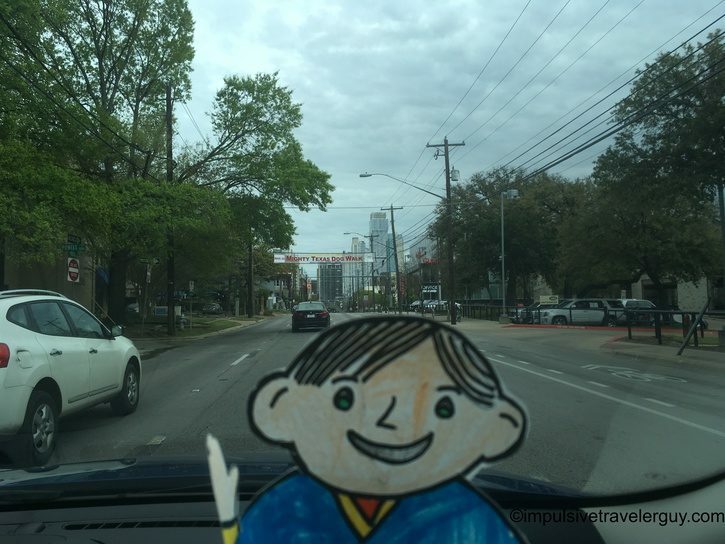 We all jumped in the car and drove downtown a little more to look at all the big buildings. 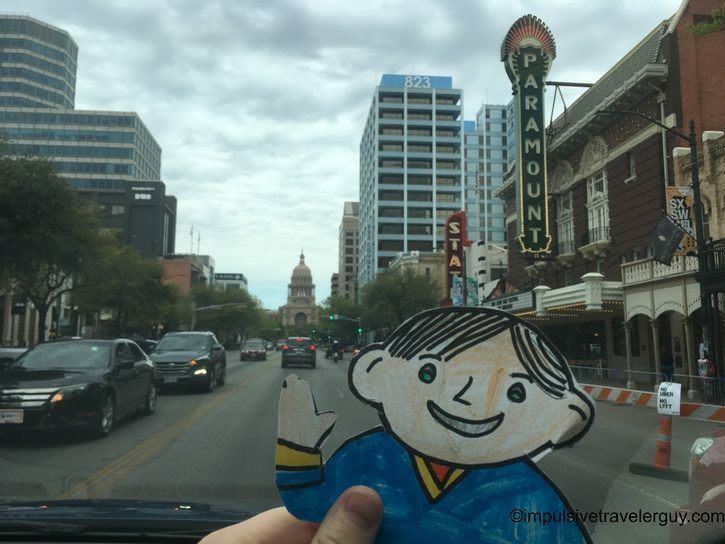 The festival South by Southwest was going on, so downtown was especially crowded. 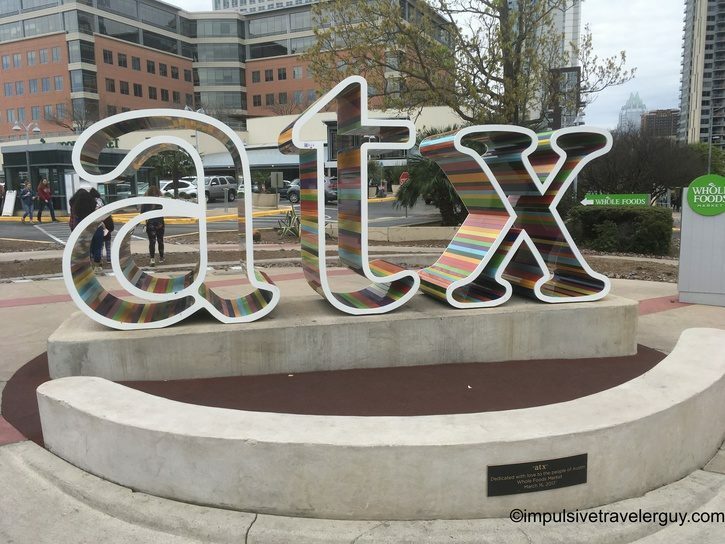 Normally, I would not come downtown during the festival, but this was a special occasion and no trip to Austin is complete without seeing it! 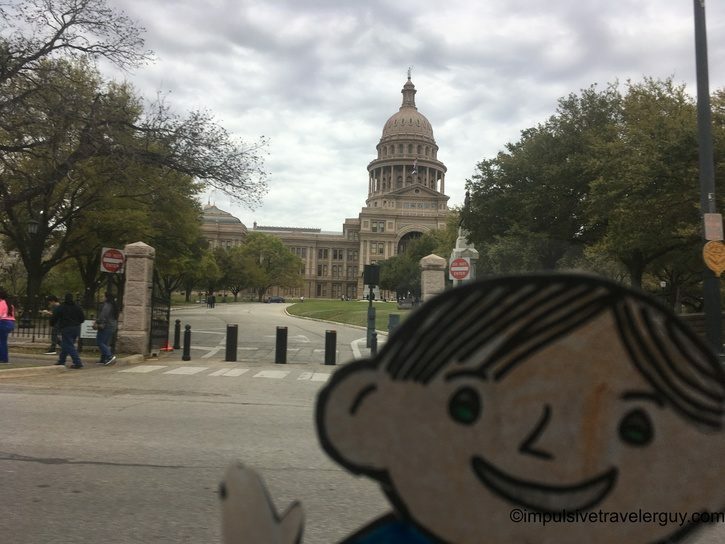 We also had to see the actual capitol building where the State of Texas makes its laws. 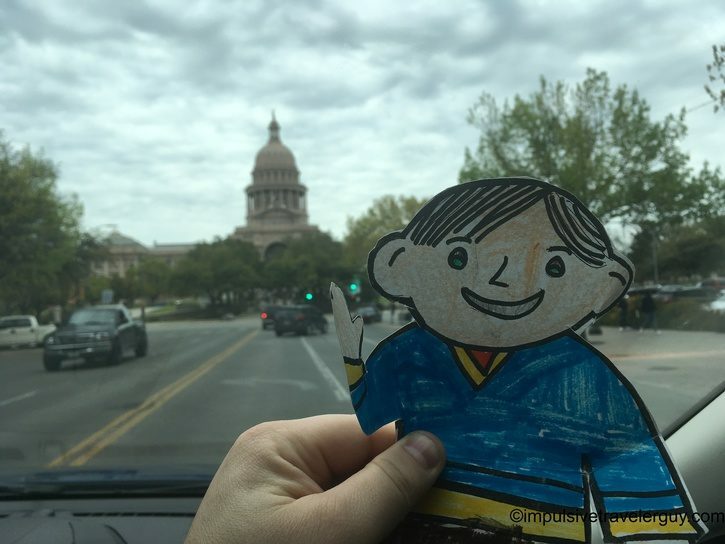 We drove down Congress Avenue and the capitol building got bigger and bigger! 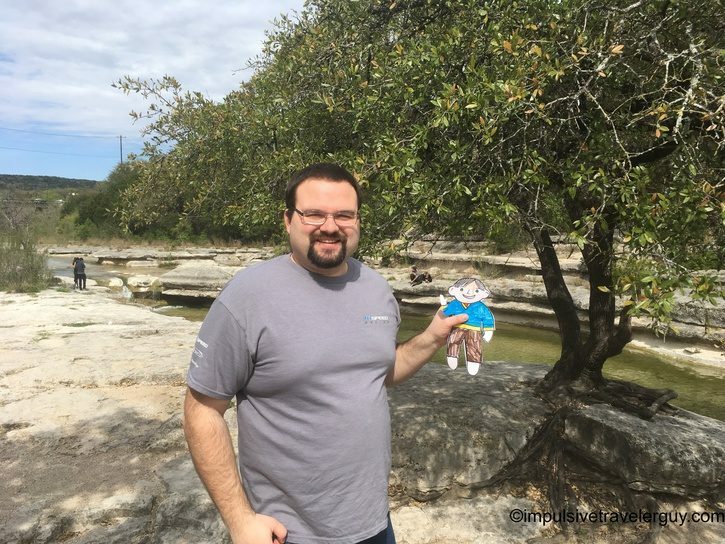 It did not take long to get back into the scenic areas of Austin. It is really the best of both worlds where you get city and country all-in-one! One thing about the city is the traffic. 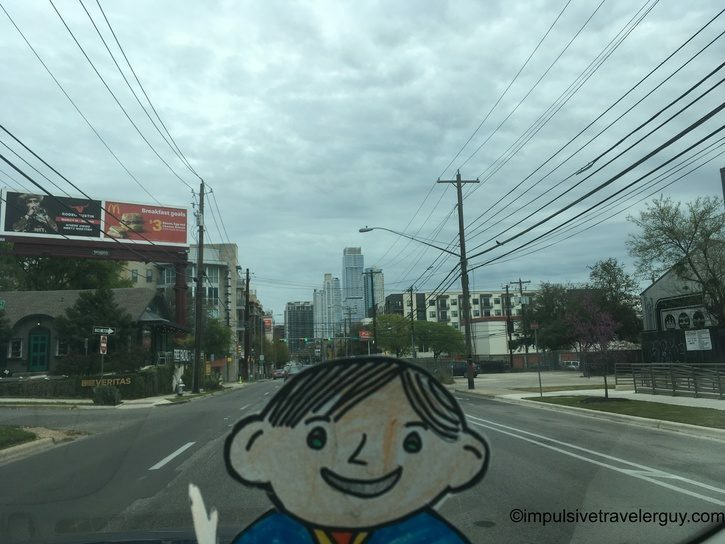 Many people are moving to Austin. 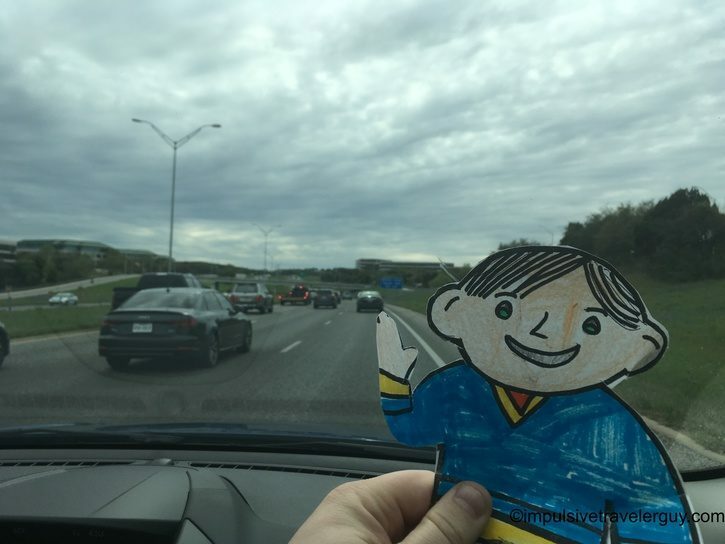 With so many people, traffic jams are a way of life. 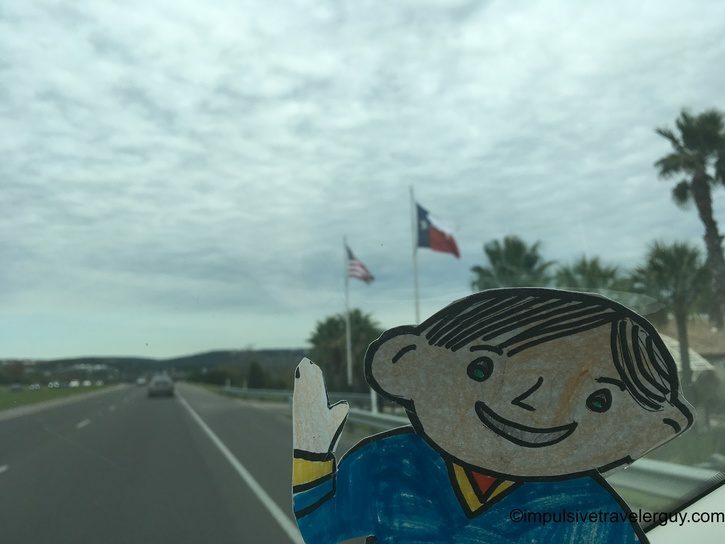 We made it through the traffic jam and got back onto the Capital of Texas Highway. 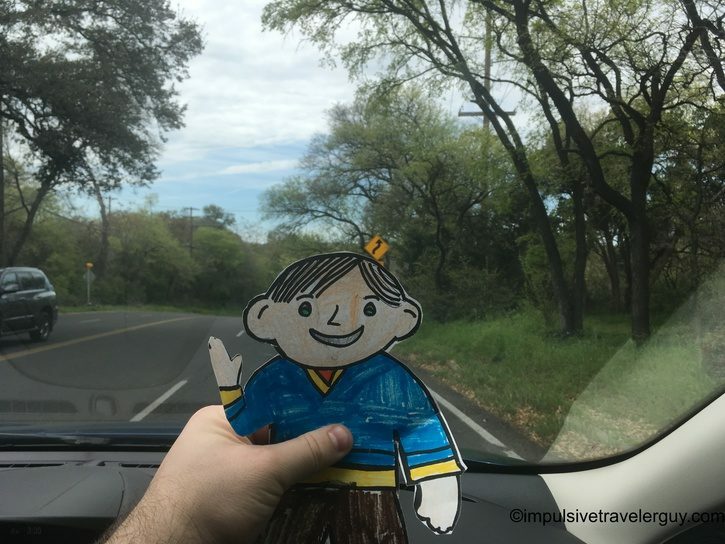 We drove back to where we came from. 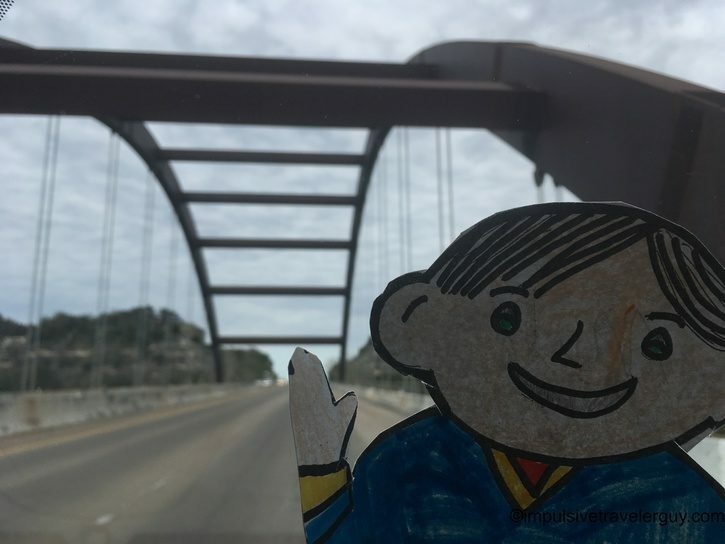 I pointed out to Flat Max the Pennybacker Bridge. 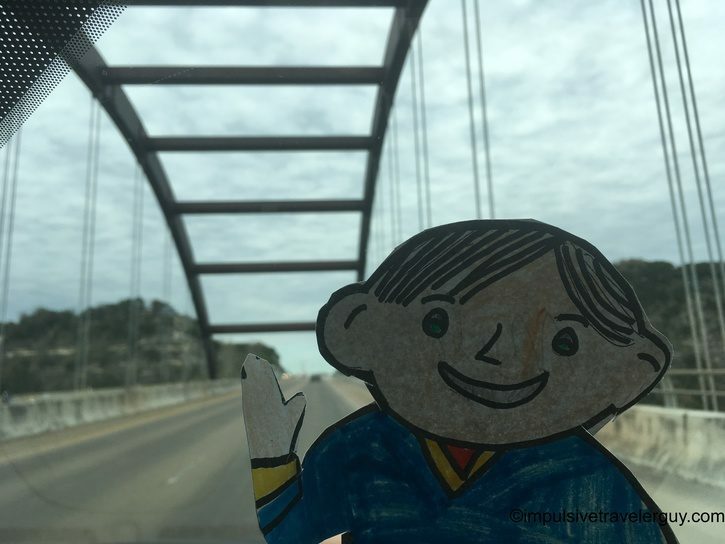 This rust colored bridge is another famous landmark of Austin. 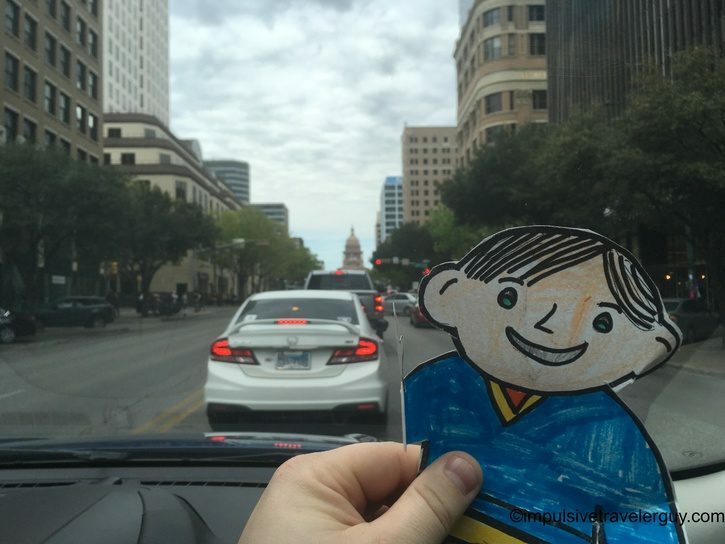 We had such a fun time showing Flat Max around Austin. We were sad to see him go. I’m sure he misses his family and all the great things about Marshfield. 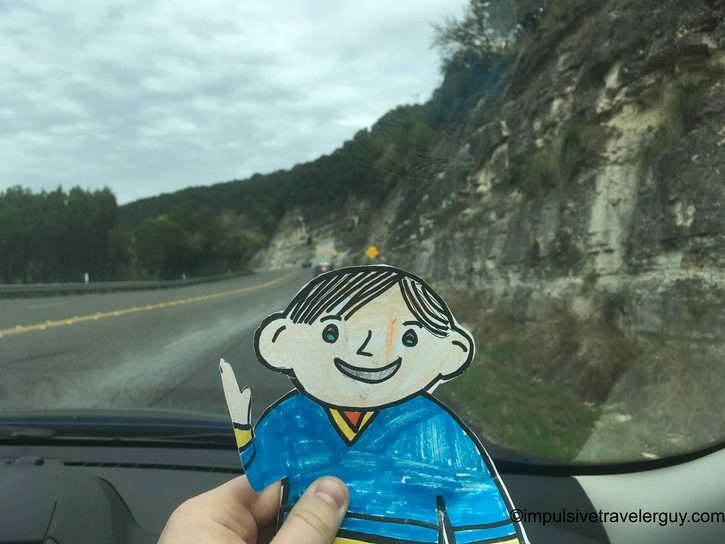 I am really hoping he had a good time in Austin! 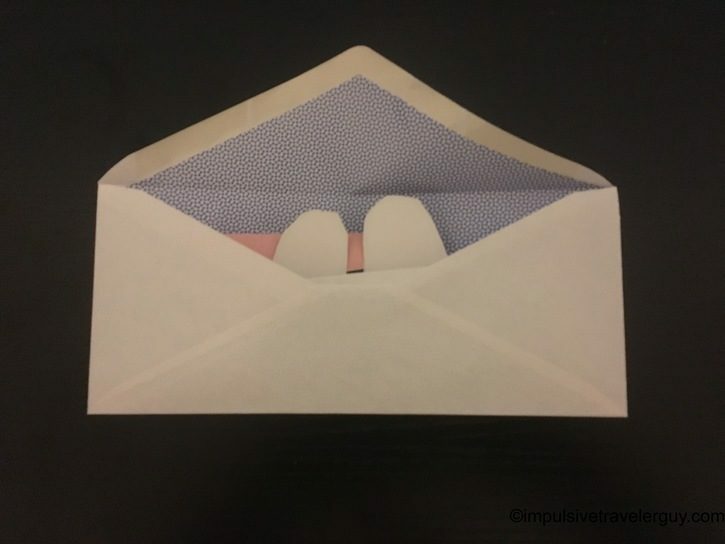 Flat Max jumped into the envelope. 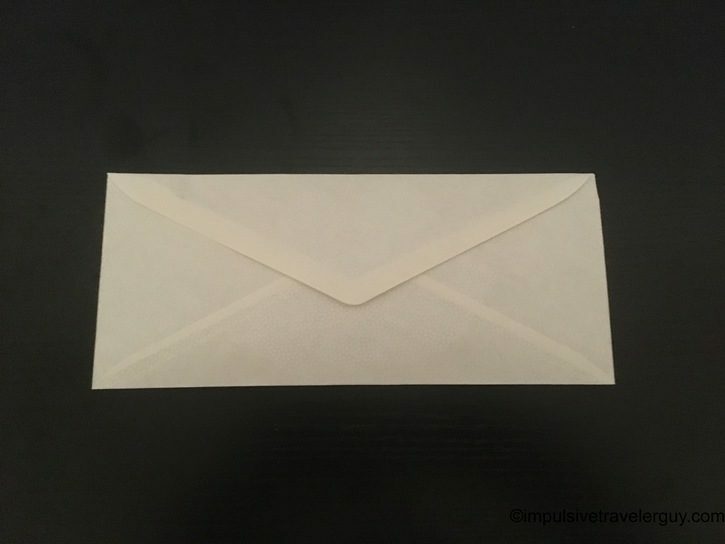 I closed up the envelope and then put it in the mailbox. The mailman should take him back to Marshfield. I told him to say hi to everyone from me!